Nevernight by Jay Kristoff. Harper Voyager, 2016. Ebook. 448 pages. I have been wanting to post this review for what seems like ages now, but since I generally tend to post my review closer to the release date, I've been waiting and waiting - but I am waiting no more! Nevernight is truly a masterpiece of immense proportions. If you want a brief review: Go read this book. If you want a more expansive review, please do read on. This was my first experience with Kristoff's writing, and I fell in love with it almost immediately. By probably the fifth page or so, I could tell that he was one of those authors that writes with a wonderful flow and instead of merely using words to convey his story, he commands words to say what he wants - his storytelling becomes those words. That probably sounds completely ridiculous, but my point is that his prose is both effortless and powerful all in one and it really makes for a breathtaking (sometimes literally for the characters) reading experience. Nevernight is essentially about a girl named Mia who hopes to join the ranks of some of the deadliest assassins in the land. There is a boatload of juicy intrigue, plots, and secrets. This a bloody, brutal book with fierce characters and competition and I loved every minute of it. First, I adored whoever our narrator was. The dry wit and sense of humor were such welcome additions to this dark story. I also particularly loved the footnotes. 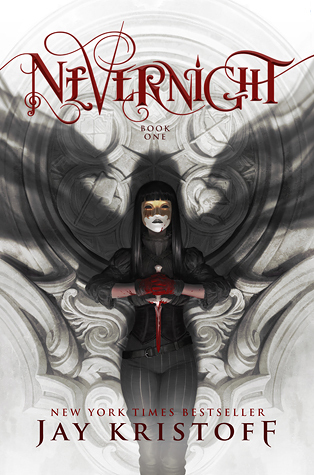 They added a wonderful dimension to the story and provided detailed background information (or mere asides) that firmly enforced the world-building and truly brought the world of Nevernight alive around me. I don't often see footnotes in fiction books (with a few exceptions), and I really enjoyed the concept. It made it feel much more like I was reading something real and authentic. For many of the chapters, there is a switch between the telling the story of the present day and telling the story of Mia's past and what got her to the present day. This was one of those rare occasions in which I liked the occasional switches between present day and experiences from Mia's past. Sometimes these can be overdone and a tad on the dry side, but learning about Mia's past was just as interesting and also helped with understanding her and her story. This brings me to Mia, a realistic, badass, and wonderfully developed character that I loved reading about. She's serious and tough, but also maintains her own distinct sense of humor and endearing personality. Along with Mia is Mister Kindly, her not-cat shadow that acts as her constant companion; I loved the relationship between the two characters, as well as the overall concept of what Mister Kindly is as well (keeping it vague because spoilers). As far as secondary characters go, there is such an abundance of outstanding ones that I'm not going to go through and discuss each one individually here because I'm pretty sure none of you want to sit and read this review all day. 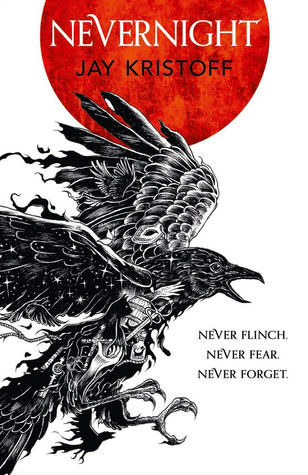 Suffice to say, Nevernight is full of interesting, well-developed, and wonderfully molded characters that do nothing but add immense depth and entertainment to the story. I was so immersed in this novel that I ended up speeding through it faster than I've sped through a book of this size in a while. The ending was absolutely brutal and beautiful and heartbreakingly perfect all in one. I sat in awe for quite a long time after finishing this book, and I still occasionally like to sit back and think about what a wonderful journey this book was. I would like to quickly add that I was pretty confused for the first few pages, as I wasn't sure how long the parallel format storyline was going to continue (despite how wonderfully written it was), but once I got into the groove and things started happening, I was completely hooked and everything fell into place. Side note: I've been on a very successful book buying ban this year (I've bought hardly any books - most have been ARCs or library books, though I do go to a lot of library sales... but they're so cheap I don't always count them), but I completely splurged and went for the red stained pages from Goldsboro - I'm so excited and it's gorgeous! I think a star explanation is unnecessary - this is hands down a five-star book that earned itself a place on my favorites shelf. And I personally don't even want to compare this to Harry Potter because it's in a league all on its own - no comparisons or mash-ups necessary.